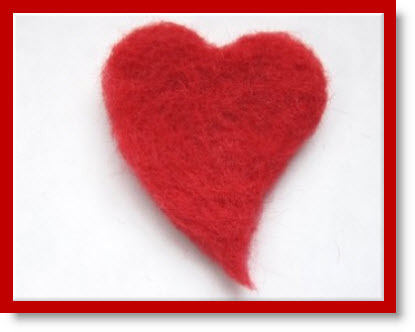 Kat of “Just Crafty Enough” has a wonderful tutorial on felted hearts and some things you can make with her cookie cutter felted hearts and her needle felted heart. 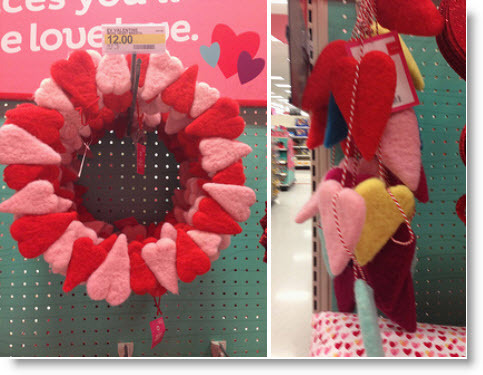 She was wandering around Target the other day and came across these felted heart wreaths and garland in their holiday section “pictured”. She really like the softer look of the wool felt hearts. Valentine’s Day is still the heart of winter and the felt has a cozy, fuzzy look. This garland and wreath would be so easy to make on at home either with hearts cut from felted sweaters or needle felted hearts. Hearts cut from regular felt wouldn’t have the thickness and body of felted ones. I like the way Kat’s has the little flip on the point, too cute. The one picture she took at Target to show what you can make. Thanks for featuring my hearts!